This lecture covers mostly the subject of the momentum of deeds and through it one comes to understand that no deed, good or bad should be taken lightly as all our deeds have a reaction. 13:08 – Why does Allah swear by the night and day? 18:17 – Who is the best in the sight of Allah? 27:43 – What do all of our activities boil down to? 34:33 – What is taqwa? 42:28 – How do good deeds create momentum? 48:07 – Three characteristics of the person heading towards damnation. 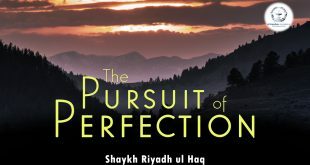 57:27 – What happens when a person embarks on the road of sin? 1:03:22 – What are the 4 traits of hypocrisy? 1:10:53 – When a person dies, what three things follow him? 1:17:00 – What is the best charity?